Wouldn’t Tri-met serving the drinking crowd at 2:30-3:30 be a good public service that could be supplemented by public safety dollars? It seems that not having the service means that people tend to drive more to bars rather than take transit. That’s not a good recipe. There are two problems with TriMet trying to provide service. 1. Downtown, where a large part of the drinking in the area occurs, people just walk or ride bikes. They don’t even bother to try transit. This is of course awesome, but makes for really low ridership numbers. 2. In the burbs most people just drive, and yes, drink and drive. TriMet has no chance of capturing much of this crowd to begin with. So there options are to tell people to not walk and ride bikes to bars, and take TriMet instead. I don’t imagine that would work well. The other problem is costs, liability (the itty bitty bit TriMet actually does have) becomes a much much higher cost trying to serve the 2am-4am crowd. I’d love to see the service myself, but can’t imagine it ever becoming feasible. "There are two problems with TriMet trying to provide service." The problem with that argument is that 85% of all trips in the Portland metro area are taken by private automobiles. So should TriMet give up and go away? TriMet just doesn’t even market its own service, unless it’s a new line opening up. You never see TriMet marketing its own routes (especially the bus lines) like a common retail outlet would advertise its locations. So of course most people walk/bike/drive to their location. Only a statistical few take the bus – and then only when it’s so freaking convenient (i.e. "free" parking) and for a specific purpose (i.e. commute to/from work) and on a specific vehicle (i.e. a certain MAX train, a certain express bus route). For everything else – there’s your car. Granted, up north in Seattle the percentage of trips by transit is about identical to Portland, but at least I get the impression that they’re trying. You see transit being developed to serve people, not developers and politicians. 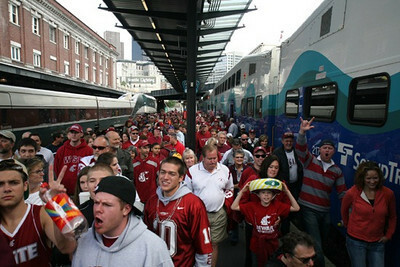 You see the commuter trains between Everett, Seattle and Tacoma that move HUNDREDS of people at once. You see the express buses with the nice shiny motorcoaches. You see the route-deviation buses that actually go into the neighborhoods and will provide as-close-to-door-to-door service as is possible. Transit stations are nice, oversized, prominent locations where you actually can wait for a bus in something more than a two-person common bus shelter (i.e. Willow Creek "TC", Hollywood "TC", Parkrose/Sumner "TC", Lake Oswego "TC"). Since TriMet willingly serves the post-New Years crowd, it can certainly provide the service the other 364 drinking nights out of the year. "You never see TriMet marketing its own routes (especially the bus lines) like a common retail outlet would advertise its locations." Considering TriMet spends a rather large amount of money on marketing one would think it could be coordinated a little better. Maybe the individuals in the department do make endeavors, but it isn’t all that visible like Sound Transit’s efforts. Now if we compared TriMet’s to King County Metro’s, things would be reversed. King County Metro seems often to be running a secret stealth service – I’ve heard so many people complain about how hard it is to figure out what is going on with the Metro buses, but I’ve rarely heard/read the same complaints against Sound Transit. Your other points are really good too. As for the door to door service, keep in mind in the more urban areas of Portland (i.e. between the west hills & 82nd) there are a lot of buses that provide that level of service. When exceeding that primary boundary the service starts to dissipate almost as fast as the density. I could point out numerous areas though (as I’m sure you could also) where a bus route could garner a solid ridership in a very short period of time. As always Erik – thx for the comments. "keep in mind in the more urban areas of Portland (i.e. between the west hills & 82nd) there are a lot of buses that provide that level of service. When exceeding that primary boundary the service starts to dissipate almost as fast as the density"
Whereas up north there is a real effort to serve the entire district (or at least so it seems) TriMet (and its partners) openly admit to saying "we’re going to provide good service in the core, and if you live in the burbs we’re not going to try — but we’re still happy to collect your taxes". I like Sound Transit’s funding mechanism where revenues and expenditures have to match – you can’t use East King County’s money on downtown improvements, for example, or use Snohomish County revenue in Pierce County. Everyone gets what they pay for; and right now with TriMet the downtown core has received a disproportionate amount of capital investment at the expense of Clackamas and Washington Counties. Yes – Clackamas County is finally getting MAX lines but do you really count a MAX line that barely enters the county and doesn’t really SERVE the county? Washington County at least has a MAX line between Beaverton and Hillsboro and that WES line…but according to the TriMet Board member for the county the westsiders still pay more than what they get in return. Erik, I agree with you that TriMet service should be better marketed. However, think about this … it doesn’t have to be TriMet that does the marketing. We had a similar discussion in L.A. how information for a street festival was hard to come by, and how Metro didn’t market it. I said that this is something that riders can do for themselves if the agency is too slow to organize and implement marketing. Erik, you and Adron could team up and market TriMet routes, and even run a profitable Web site and publishing house. One of the best examples of crowd-sourced transit marketing is Rail Life, a site and blog promoting activities by Phoenix’s new light rail line. It can be seen at http://raillife.com/blog/. Phoenix, Arizona! The strategy also spawned another blog, a light rail food review site, http://www.phxrailfood.com/. Think along this same vein. You could bring together a Yelp-like review, a Google Map mash-up, and bring together where to live and where to go. If you get enough advertisers, you can even produce a print guide.